This tower always makes it relatively easy to figure out which direction my house is. 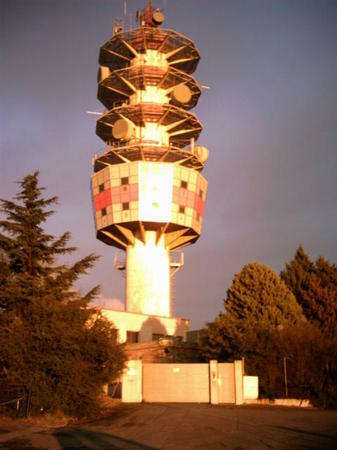 We live on a set of hills, Les Hauts de Ramonville, and on top of the tallest hill is this impressive-looking 71m tall telecom tower, full of, I suppose, micro-wave antennas. You can see it from pretty far away. OK, we luckily don't live right next to it, but a few hundred meters from it at least. Free apps, games, live wallpapers, widgets, and themes for Android mobile devices. Download APK for Android Apps & Games from APKDom.com. Full APK Version History, http://apkdom.com Direct APK download and Multiple Mirrors. Direct Download APK for Android Apps & Games Pranky Apps http://prankyapps.com Best Prank Apps Android. School ideas and tools for your kid and parents. http://kidatschool.com Get help organizing your school work.